Everyone’s a Winner at the BORP Poker Night Fundraiser! Katherine Russell was a big winner at the 2018 Poker Night Fundraiser. After taking first place in this annual fundraiser for BORP’s Power Soccer program, Katherine found herself loaded down with prizes, including tickets to the SF Giants and the Curran Theater, as well as several bottles of wine. 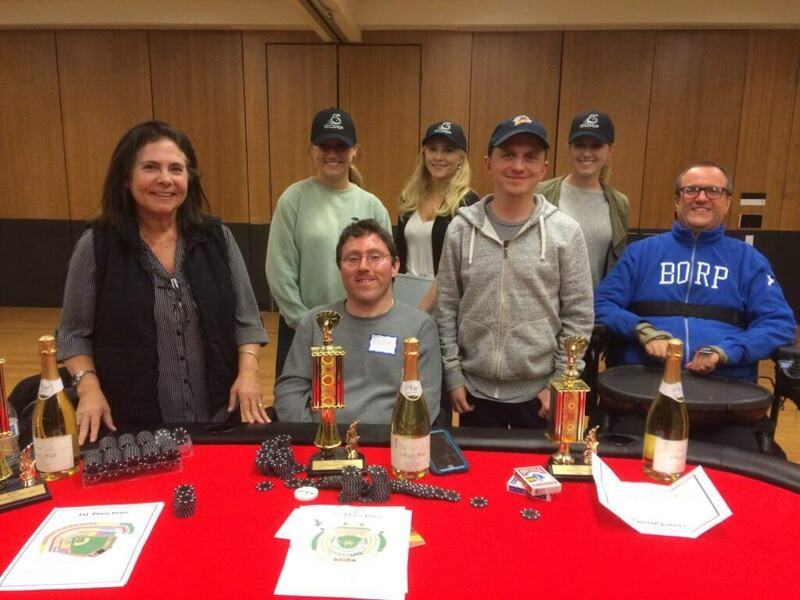 Katherine (left) along with other winners of the 2018 BORP Poker Night, Chris, and, in back, members of the UC Berkeley Delta Gamma sorority who volunteer to help out at the event every year. Katherine first learned about BORP in 2010 when she was making a documentary about power soccer. That experience turned her into a longtime BORP supporter. “The staff are amazing and BORP is such an incredibly well-run organization,” she says. For newbies, there’s a poker tutorial at the beginning of the evening. Katherine also points out that novices often receive tips from more experienced players during the games. “I’ve seen people who have no idea what they’re doing go on to win big pots,” says Katherine. In fact, most years, complete beginners walk away with at least one of the prizes—and there are plenty to go around. This year, prizes include a private winery tour and tasting, tickets to the Giants and the A’s, Cal Shakes tickets, and an array of gift certificates. Still, even if you don’t leave with one of the prizes, after such a fun-filled event, everyone walks away a winner.